Metropolitan Hilarion was met at the airport by H.E. Alexander Avdeyev, Ambassador of the Russian Federation to the Holy See; archimandrite Antony (Sevryuk), secretary of the Administration of the Moscow Patriarchate’s parishes in Italy; Rev. Hyacinthe Destivelle of the Pontifical Council for Promoting Christian Unity; and Rev. Alexiy Dikarev of the DECR Secretariat for Inter-Christian Relations. Greeting Metropolitan Hilarion during the session were Pope Frances; Cardinal Pietro Parolin, State Secretary of the Holy See; Cardinal Bechara Al-Rai, Patriarch of the Maronite Church; Cardinal Kurt Koch, President of the Pontifical Council for Promoting Christian Unity; Archbishop Vincenzo Paglia, President of the Pontifical Council for the Family; other members of the Synod, as well as representatives of the Non-Catholic Churches and communities. Attending the Synod’s sessions are observers from the Patriarchates of Constantinople, Moscow, Serbia and Romania, the Orthodox Church of Albania, the Coptic and Jacobite Syrian Churches, the Anglican Communion; the Lutheran World Federation, the World Methodist Council, the Christian Church (Disciples of Christ), the Baptist World Alliance and the World Evangelical Alliance. 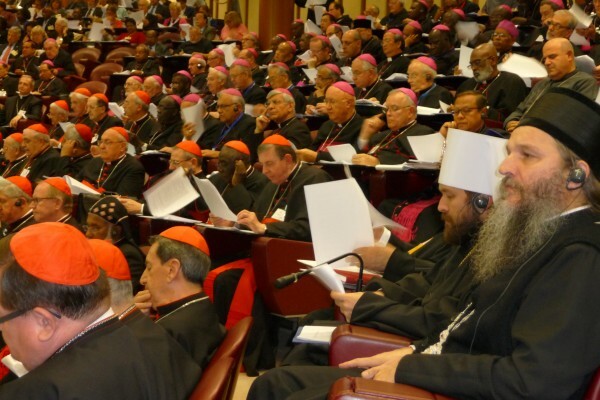 The 14th Ordinary General Assembly of the Synod of Bishops of the Catholic Church will complete its work on October 25.